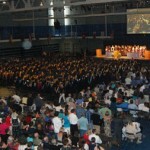 The Class of 2011 graduated on Tuesday evening, June 7 in front of nearly 4,000 family and friends at the Franklin & Marshall College Alumni Sports & Fitness Center with hundreds more watching the live webcast. 427 graduates were presented with their diplomas and recognized for their achievements by Principal Philip Gale. Senior Katie Maisel welcomed everyone to the new venue. Valedictorian Ben Clark and Co-Salutatorians Helen Hutchens and Lars Andersen gave inspiring speeches to their fellow graduates. Class President Jesse Graham passed the torch to Ellen Blazer, president of the Class of 2012. Anderson Olson wrapped up with evening by remembering the past four years with popular song lyrics. Congratulations and Best Wishes to the Class of 2011. 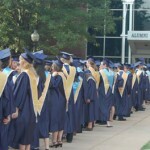 Approximately 170 online participants viewed the live 2011 Commencement Webcast. The recorded video is available on the Penn Manor Ustream channel: http://www.ustream.tv/recorded/15233214. Pictured are the Class of 2011 commencement speakers. From left, Jesse Graham, Anderson Olson, Ben Clark, Helen Hutchens, Lars Andersen, and Katie Maisel.